Check out our Valentine Gift ideas! This year's Valentine features a play on words that sound alike but mean different things: homophones! "Hey, Valentine, let's ketchup" features a hot dog chasing a bottle of ketchup squirting Valentines - plenty of silly fun for boys and girls and friends of all ages! These zany Valentines are in print and braille. the backside is a brief bio of Louis Braille. 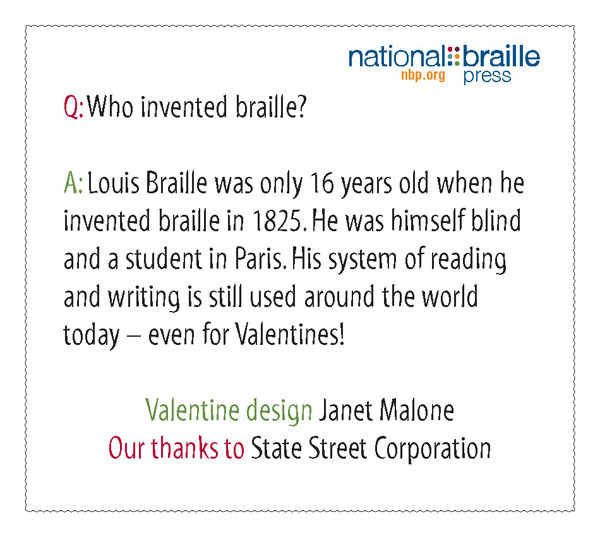 A: Louis Braille was only 16 years old when he invented braille in 1825. He was himself blind and a student in Paris. His system of reading and writing is still used around the world today - even for Valentines! Valentines from previous years are also available! Check out all the available cards here.